An increasing number of couples today are dependent upon women’s labour income. Along with an increase in dual-earner couples, couples where the woman out-earns her partner are also on the rise in Europe (Vitali and Mendola 2014). Yet, little is known about who these female-breadwinner couples¹ are, and why and where they are emerging. Results from a recent study (Vitali and Arpino 2016) shed light on the current geography of female breadwinning in Europe. Analyses of European Social Survey data for 2010/2011 show that female-breadwinner couples are especially widespread in Southern and Eastern-European countries and in Ireland (Figure 1). The Spanish regions top the ranking: results from statistical analyses predict that in about one in four couples in the regions of Canarias, Andalucía, Comunidad Valenciana, Illes Balears, Murcia and Extremadura the woman contributes all, or the largest share, of the household income. This proportion falls to about one in ten couples in regions of continental Europe and Norway. The prevalence of female-breadwinner families varies not only across European countries, but also across regions within countries. For example, Germany shows a clear East-West divide, with female-breadwinner families highly prevalent in the East and much less so in the West. How do we explain the observed differences across European countries and regions? Female-breadwinner couples, the study finds, are especially widespread in the regions where male unemployment is also high, such as Southern and Eastern Europe and Ireland. In other words, the observed pattern of female-breadwinner families is the result of structural barriers that constrain women’s and men’s preferences concerning their labour market participation and earnings. During the economic crisis, many European countries witnessed a decline in real earnings and increased unemployment rates, especially for men. Men, on average, were more exposed to unemployment than women, due to the gendered distribution across different industries that were unevenly affected by the crisis. So as an increasing share of men found themselves unemployed or underemployed, an increasing share of women became the sole or the main provider of the income necessary to sustain their family. The geography of equal-income couples across European regions looks quite different from that of female-breadwinner couples (Figure 2). 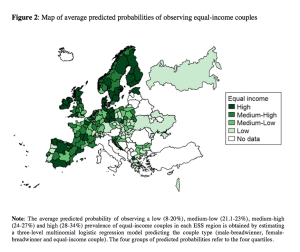 The proportion of equal-income couples is especially high in the Scandinavian countries, Ireland, Estonia, East Germany, and parts of Spain, France, and the UK. Leading the ranking, with equal-income couples representing about one in three of all couples, are the French regions of Limousin and Picardie, the German region of Bremen and the Spanish regions of Canarias, Murcia, Madrid, Asturias, and Castilla y Leon. By contrast, the prevalence of equal-income couples is low in Eastern Europe, Greece, Cyprus, and Israel. Unlike the case of female-breadwinner couples, male unemployment is only marginally correlated with the variation in equal-income couples across Europe. Here, what matters is the diffusion of gender egalitarian attitudes. In other words, equal-income couples are more prevalent in regions where gender egalitarian attitudes are more widespread. In the aftermath of the economic crisis, female breadwinners do not appear to be high-earning career-oriented woman. On the contrary, they are likely to be the main income provider of households experiencing economic difficulties. The female breadwinner arrangement is related to men’s precarious labour market situation and is not the product of a genuine choice among couples where the woman is better educated than her partner and hence has a higher earning potential (Esteve et al. 2016; Drago et al. 2012). Drago, R., Black, D. and Wooden, M. (2005). Female breadwinner families. Their existence, persistence and sources. Journal of Sociology, 41(4): 343–362. Esteve, A., Schwartz, C., Van Bavel, J., Klesment, M., and Garcia, J. (2016). The End of Hypergamy: Global Trends and Implications. Population and Development Review, 42(4). Vitali, A. and Arpino, B. (2016). Who brings home the bacon? The influence of context on partners’ contributions to the household income. Demographic Research, 35: 1213–1244. Vitali, A. and Mendola, D. (2014). Women as main earners in Europe. CPC Working Paper 56, ESRC Centre for Population Change, UK. ¹ We use the term ‘female breadwinners’ to identify families where the woman is the sole income provider as well as those where both partners are income providers but the woman contributes the largest share of household income.